Bristol Nuclear Protestors Fined for Protesting Dangerously Cracked Graphite Reactor: Shouldn’t they be awarded Medals Instead?! Graphite fires are almost impossible to put out and can burn for days. The ones in Scotland are dangerously cracked too. Windscale and Chernobyl both used graphite and contaminated areas far, far away. Three nuclear safety campaigners from Somerset have each been fined £300 for their ‘criminal’ actions in highlighting the far greater nuclear crimes by the industry. 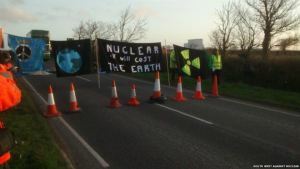 MAGISTRATES imposed £300 fines yesterday against three Bristol women for blockading the road to nearby high-risk nuclear power station Hinkley Point. Care worker Ornella Saibene, grandmother Caroline Hope and retired nurse Marian Connolly appeared at Taunton Magistrates’ Court where they chose to plead guilty to avoid much larger penalties and costs. The court refused to set repayments any lower than £10 a week even after they heard the trio were on low incomes, they told the Star. They are considering whether to lodge an appeal over the convictions.